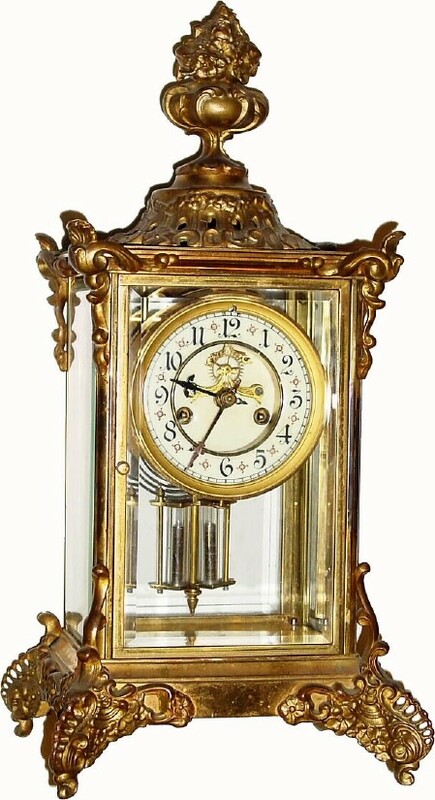 C.1903, Waterbury Clock Co., "Avignon" 8-day time/strike crystal regulator. This is a nice clock in unrestored condition. This is the optional gold plated model, and some of the plating has worn off. The beveled glass panels are perfect. The dial is perfect. The decorative elements that appear on either side of the lower part of the front door are missing in the rear...been gone a long time, one must have broken and the other was filed off to match. Still a good looking clock. Height 17 1/2"